The Permian Basin in West Texas is one of the most prolific hydrocarbon producing basins in the world. It covers about 194,250 square kilometers (75,000 square miles) in West Texas and southeast New Mexico. The first well was drilled in 1921, in Mitchell County on the east side of the basin. Since then it has produced approximately 29 billion barrels of oil and 75 trillion cubic feet of gas - yet it is estimated by industry experts to contain recoverable oil and natural gas resources exceeding what has been produced over the last 90 years. In 2010 and 2011 alone, the Permian Basin produced more than 270 and 280 million barrels of oil respectively. Some of that remaining oil is being produced through the application of secondary and tertiary recovery methods like water floods, steam floods or CO2 floods, but an increasing proportion of it is being produced as the result of new technology that allows drillers to complete and produce wells at depths and in formations that previously eluded them. The Permian Basin is made up of three component parts, the eastern Midland Basin, the Central Basin Platform and the western Delaware Basin. These structures existed throughout the Carboniferous, Permian and Triassic periods. The Midland Basin and the Delaware Basin were rapidly subsiding features that accumulated sediments, including black, organic-rich, deep-water materials that would become petroleum source rocks in later geologic time intervals. The Central Basin Platform remained relatively high in elevation and accumulated deposits of coarse-grained, shallow-water sediments and saw the development of small reefs. These reefs became good reservoirs for petroleum. As the result of tectonic and sedimentary differences, the Midland and Delaware Basins differ significantly in detail. 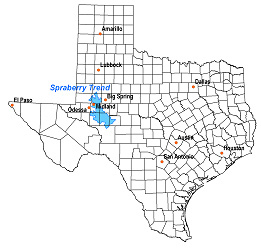 In the Midland Basin, where Target's Fairway Project is located, during the Carboniferous Period and the early part of the Permian Period, vast quantities of eroded and broken rock were laid down as a thick, subaqueous delta system that gradually filled the basin from east to west. In addition to vast quantities of crude oil and natural gas, some of which Target Energy is now producing, this delta also contains important fossils of amphibians, reptiles and synapsids (mammal-like reptiles) that were abundant during that period. In contrast, the Delaware Basin received relatively minor amounts of sediment from the lower coastal plains. By the beginning of the Middle Permian Epoch, some 271 million years ago, the Midland Basin was nearly filled with sediments, while the Delaware Basin continued to receive deepwater inputs. As the Middle Permian Epoch continued, the Delaware Basin became rimmed with luxurious, reef-like, carbonate build-ups. Unlike modern reefs, these were likely built by sponges, algae and microbial organisms, although bryozoans ("moss animals") and brachiopods (marine animals that have hard "valves" or shells), which stabilized large amounts of carbonate sediment were also found. These reef deposits formed the Capitan Limestone, which is 600 m (1,970 ft) thick, and dramatically exposed in the Guadalupe Mountains National Park in West Texas. As the Permian Epoch progressed, the reefs formed a region of higher elevation that separated marine and non-marine shallow-water deposits from the organic-rich deep-water deposits of the basin.